I´m wearing the Løvfallgenser by Strikkelisa. This pattern is so far only in Norwegian. I knitted a size XL and it worked wonders with my firm knitting style. I´ve used slaughter-free yarn from Izzy Lane for this project and I loved it! I will be knitting more items with this yarn! For this project I used the colourway natural grey. Bellatrix cowl by Heidi Braacx using yarn from her store which you can find at veganyarn.com. My last knitted work in progress is Gaïa by Marie Adeline Boyer. It´s a shawl pattern, but I´m gifting it as a baby blanket once it´s done. I´m using Malsen og Mor Shetland soft in the colourway skog for this project. I also talked about my latest spinning project. I got a hold of washed fleece from Scruffydogyarn on Etsy, and I´m having a lot of fun with it! This wool comes from a pet sheep that will not end up as someone´s dinner. I have a big bag of this wool, so stay tuned to see what it will become! I´m also raving about my beautiful bag from Busy Pottering on Etsy. I also drew the last 4 winners of the 2017 gift making KAL. So if you participated with projects and/or chatter, you should have a look at this episode. I´m podcasting in my PJs. Why not? I´ve started a new project! Løvfallgenser by Strikkelisa. I´m knitting it in slaughter-free yarn from Izzy Lane. My lovely bag is from Busy Pottering and inside I keep the Almost Ribbed Socks by louleigh. I´m also working on a pair of simple socks in Opal yarn. Roma Mittens by Matilda Kruse and I´ve used yarn from Hooligan yarns. And the name of the sheep who gave the yarn is Guthrie. And last but not least I´m showing you a book I got from a dear viewer. Hand made, recycled, hand dyed. It´s precious! Long time, no see… but I haven´t been lazy! I´ve finished a giant shawl. What the Fade?! by Andrea Mowry. I used yarn from garnsurr.no. I also finished the Osmosis for my mother. I knitted myself a hat in Malabrigo Rios. I improvised as I went along and did a broken rib for the main part of the “body”. 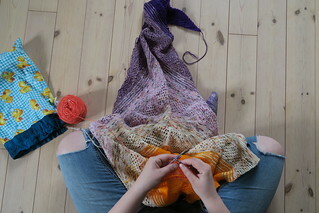 I´ve started another crazy shawl! Speckle & Pop Shawl by Stephen West. …and I´m test knitting a shawl for my friend. Under the bridge by Renate Dalmo. I got some lovely new stitch markers from Victorian Studio Shop on Etsy and another issue of Laine Magazine. Ep. 10 – Gift knitting has begun! I finished a pair of Afterthought heel socks by Laura Linneman in Self striping yarn from Stray Cat.